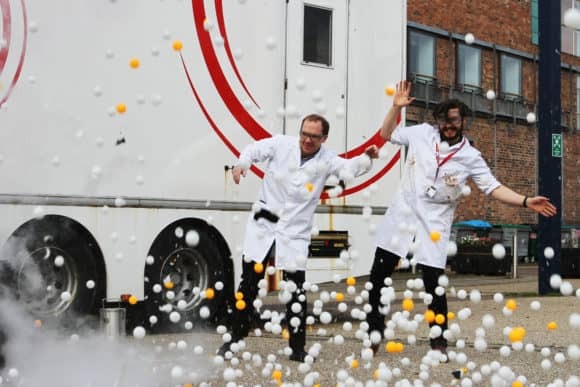 The programme for Dundee Science Festival was officially launched in an icy blaze of liquid nitrogen today (Wednesday 18 October 2017). Dr David Foley and Paul Strachan launch the festival programme in style! Credit: Mhairi Edwards, Evening Telegraph / The Courier. Now in its eighth year, this celebration of science will descend upon the city from Saturday 28 October through to Sunday 12 November 2017, with over 30 events designed to entertain, inspire and fascinate, most of which are free of charge. Visitors attending events within the host venue of Dundee Science Centre will enjoy a 50% discount on their entry fee. As the 10 day countdown begins, the festival was officially launched today by two of its most popular participants, Dr David Wharton and Dr David Foley, alongside volunteer Cara Neil. Building on their crowd-pleasing and explosive shows during previous festivals, the fun-loving Dundee scientists revealed a blazing glimpse of what audiences can expect at ‘Big Bang: The Rocket Men Show’ on Tuesday 7 November 2017 (50% admission, 5.30-7pm and 7.30-9pm). Throughout Dundee Science Festival, the emphasis will be on exciting and accessible events, with the majority taking place within community centres and hubs as well as Dundee Science Centre. While the emphasis is on family fun, there’s plenty for adults too – come along to learn about the early years development of children, how to upcycle your own jewellery or gain some expert advice on topics such as Dundee Science Centre’s redevelopment of the first floor, Medical Marvels, and ageing! Three, special family fun days will also run on each of the weekends throughout the festival. Meanwhile, join Gulliver on his journeys through different worlds on Saturday 4 November. Following the famous story of ‘Gulliver’s Travels’, visitors can see how it feels to view our environment from the perspective of a giant and then realise how tiny they actually are! This event will run in partnership with the University of Dundee and the Being Human Festival. The Digital Past’ will team up with NEoN Digital Arts Festival on Saturday 11 November to bring a fascinating day-long event focusing on the use of technology to reflect on years gone by, digital embroidery and find out how the plastics you live with will outlive you! There will also be the chance to learn about the ‘Animal Kingdom’, discover how our bodies work and relax with free science ‘Storytime Sessions’ for children aged three to five, held in four different community venues. For more information, and to view the programme in full, please visit www.dundeesciencefestival.org or follow Dundee Science Festival on social media.